I've had The Essential New York Times Cookbook, by Amanda Hesser, for a few weeks now but it wasn't until this weekend that I had the time to really delve into it. And then once I got started, I couldn't put it down. I have the peculiar inclination of reading cookbooks the way most people read novels--that is, from front to back without skipping any parts in between. This one is bigger than most--about 900 pages long--with over 1,400 recipes included, so I couldn't exactly read it the way I usually do with cookbooks, but I did get through entire categories without blinking, mainly because of Hesser's witty, entertaining and addictive voice. I also picked three recipes from the book to make over the weekend, wanting to test the waters and see if the recipes were as great as their reputations claimed. Let's just say, I wasn't disappointed. This is the first of the recipes and one I thought was particularly appropriate for Monday morning--a tasty salad to whip up quickly sometime this week for an easy weeknight dinner that is just as satisfying as it is simple. 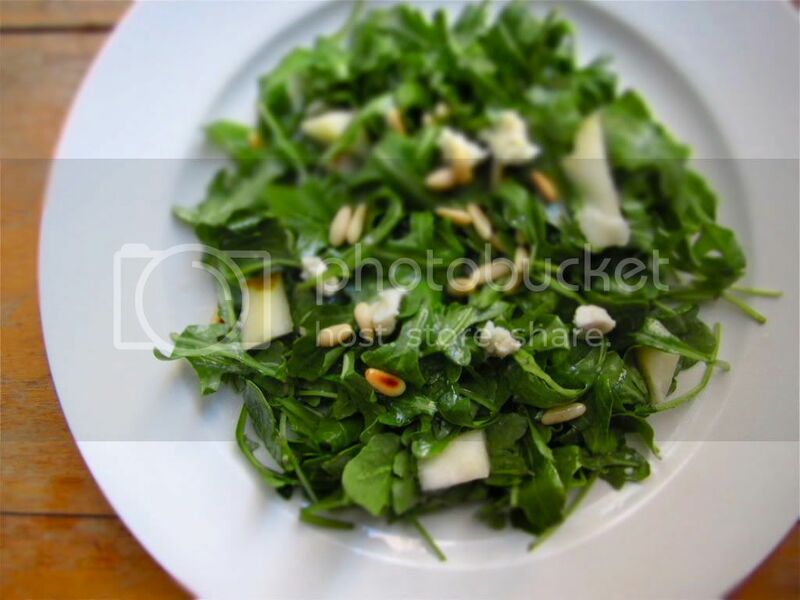 The combination of the slight bitterness of the fresh arugula, the tang of the vinaigrette and Gorgonzola, and the sweetness of the pear is absolutely perfect. I used Satur Farms wild arugula purchased from Whole Foods and bought raw pinenuts that I then toasted in a skillet over medium heat, shaking often. If you get a pear with red skin like the Red Bartlett, and opt not to peel it, then your salad will benefit from the gorgeous bursts of color it will provide--but by no means feel that you need to. I used a golden Bosc pear and it was delicious. If you want to make it meatier, you should crumble some good bacon into it as well. Wash the arugula and remove the tough stems; dry. Whisk together the vinegar, oil, and sugar in a serving bowl. Whisk or crumble (depending on its texture) in the Gorgonzola. Stir in the pine nuts. Peel the pear and cut into bite-sized pieces. Add the pear and arugula to the bowl and toss to dress well. I'm such a sucker for fruit in salads. This looks sooo good and pretty simple.